Gain medical experience in a fascinating country with diverse and lively culture and work with doctors to treat local South Africans. While South Africa has seen an impressive increase in the standard of health services, this result has yet to reach many places. Even in urban areas people still succumb to treatable diseases. Join RCDP's health project in South Africa and go where the poor and the sick are, helping them have a healthier life. You will work with local medical professionals to learn about the medical practice in South Africa and help with the treatment. The aim of the project is to increase access to basic healthcare, decrease the prevalence of endemic disease and improve overall health by providing public health projects and promoting health education. This is a wonderful opportunity for volunteers to help the poor people of South Africa. Your actual responsibility during the healthcare project in South Africa will depend on your skill and experience. Among general things, you might do are assist in consulting room, dispensary and help with physiotherapy, treatment of minor injuries, maternal help and childcare, assisting midwives on visits, and checking and recording patient's information. 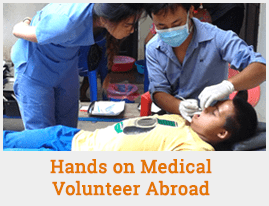 The health project in South Africa hires only volunteers who have health care certification, such as the student ID of a medical student, EMT or paramedic certification, or nursing or physician's credentials. If you are on the process of acquiring the certification, you will also be considered provided you furnish document to support your claim.